Swing into spring! The Spring 2019 Materials for Artists Flyer is filled with hot deals. Celebrate the season with low prices on paint, canvas, paintbrushes, and much more. Create outside and enjoy the sunshine with our expanded selection of plein air supplies. Shop art essentials for up to 85% off, and receive FREE shipping on orders of $59 or more. 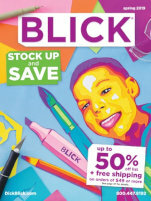 Discover out-of-this-world deals on top-rated art supplies in the Blick 2019 Materials for Art Education Catalog. Spanning 647 pages, our catalog offers an extensive selection of materials, accessories, and classroom essentials for teaching and creating art. This year, we're excited to bring you teacher and student favorites in new colors, sizes, sets, and styles. Plus, most orders of $49 or more SHIP FREE! Stock up your classroom or art room! Our Spring 2019 Flyer is packed with deals on classroom favorites, including paint, markers, paper and boards, glue, and craft essentials. Inspire your students and get creative juices flowing with top-rated products. Score big savings — up to 50% off — on art supplies and receive FREE shipping on orders of $49 or more! Blick's 2018—2019 Materials for Artists Catalog is your destination for the largest selection of high-quality art materials within more than 540 pages. Restock your studio with all your favorites, plus find new items and try different techniques. You'll find what you're looking for whether you're a student or a professional. Check out our website for the lowest prices and special offers, and receive FREE shipping on orders of $59 or more. Please send me the Blick Art Materials catalog(s) checked above! Describe your interest in art.